Reheating furnaces are used in steel mills for heating steel pieces (Billets, blooms, slabs or ingots) to temperatures of around 2200 F or 1200 C, making them suitable for Hot Rolling. There are different types of continuous reheat furnaces. The most common types are Pusher, Walking Beam, Walking Hearth, Rotary Hearth and Roller Hearth. We have more than 50 years of combined experience in Continuous Reheat Furnaces. Over the years we have developed simulation software to size, analyze and design furnaces, off-line software models to determine optimal setpoints and on-line, and Level 2 software for complete automation. We also do Reheat Furnace Study and Data Analysis for energy efficiency, performance increase, and quality enhancement. FurnXpert Continuous Reheat Software offers the ability to design, simulate and size Walking Beam, Walking Hearth, Pusher, Rotary Hearth, and Roller Hearth furnaces. 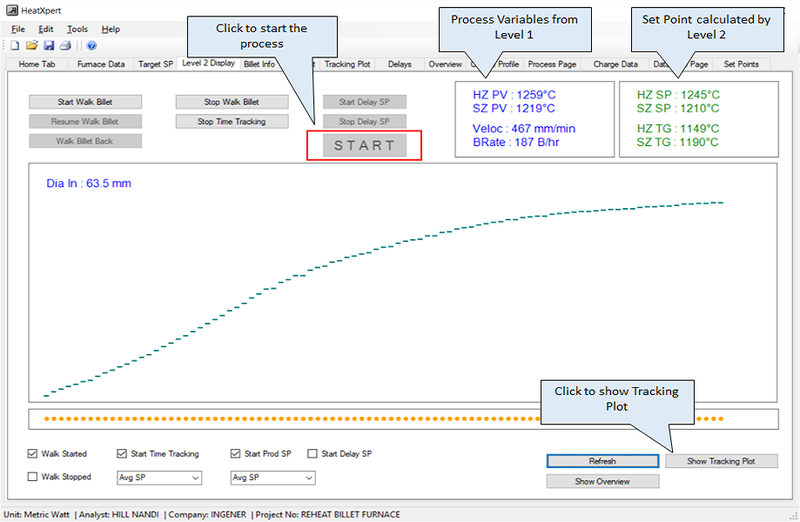 The modules of the Reheat Furnace Software are Furnace Configurator, Parts Configurator, Parts Placement, and Profile Generator. The idea is to perform what-if analysis with different Process Parameters. The software calculates temperature rise of the steel stocks along the furnace length during heating in each furnace zones. Additionally, it calculates heat to steel stocks, refractory and skid losses, opening losses, heat requirement in each furnace zones, total fuel consumption, furnace efficiency and skid mark on the steel slabs. The analysis can be done for constant production or combination of production and delays. HeatXpert off-line software is used to manage optimum heating strategy for Walking Beam, Walking Hearth, Pusher, Rotary Hearth, Roller Hearth Furnaces used in Steel Reheating. It has been developed specifically for furnace operators, to determine optimum furnace settings. Using this software, one can generate operating setpoints during constant production and operating delays while processing any size, shapes and grades of steel in continuous reheat furnaces. Recipe/Set-point Management (determination of optimum zone temperatures during constant production) The system offers the ability to create setpoint recipes (zone setpoint temperatures) for various grades and shapes of steel at different production rates. In order to raise charge temperature according to a prescribed heating pattern, temperature setpoints for each heating zones are determined on the basis of billet size and production rate. There are different sets of recipe tables based on billet size and metallurgy. HeatXpert Off-line model has the option to create tables to be printed or stored in soft documents. The other alternative is to input the production rate or product movement rate (push/walk/rotation), charge shapes and grades of the product. The software then calculates the setpoints and displays it on the computer screen. 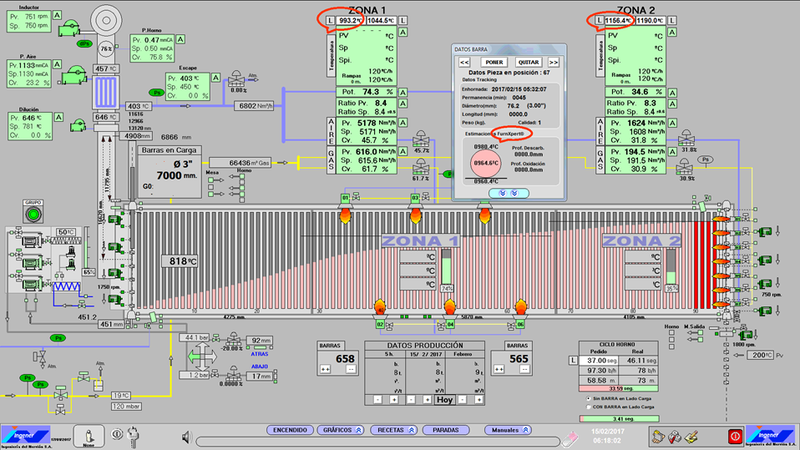 Delay Setpoint Management (determination of optimum zone temperatures during delays) The system offers the ability to create setpoint(zone setpoint temperatures) for various grades and shapes of steel at different delay time. The software handles 2 kinds of Delays. 1. Scheduled Delays, 2. Unscheduled Delays. Scheduled delays are planned and usually occur after a specific billet has been discharged. They usually take place due to maintenance work such as roll change, suspending mill production for a period of time. Unscheduled delays occur due to a problem that has caused the furnace to halt, stopping billet processing. These problems generally occur due to a furnace breakdown or problems within the Hot Rolling process. Setpoint Management (Determination of Optimum Furnace Temperature) In our on-line setpoint management module the furnace temperature in each zone is determined by real time heat transfer calculations. 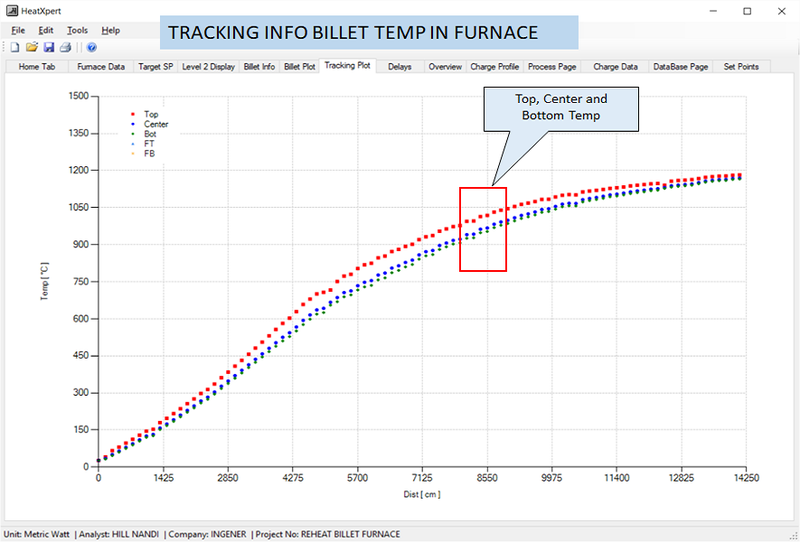 The setpoint calculation is a reverse transient computation to determine furnace profile from actual (computed) and target temperature profile of the billets and billet movement rate in order to achieve desired discharge temperature with minimum fuel consumption and scale formation. The algorithm takes into account delayed heating in order to optimize energy and minimize scale and decarburization formation. The on-line system has the capability of storing and modifying different heat curves for different grades of steel. Each curve has its own target billet temperature, zone setpoint limits as a function of charge temperature and production rate. Delay Management (Scheduled and Unscheduled) Scheduled delays are planned and usually occur after a specific billet has been discharged. The delays usually take place due to maintenance work such as roll change or suspending mill production for a period of time. Unscheduled delays occur due to a problem that has caused the furnace to halt, stopping billet processing. These problems generally occur due to a furnace breakdown or a snag in the Hot Rolling process. The delay setpoint is directly proportional to the length of the delay. Longer the delay duration, more the temperature setpoint is reduced. However, a check is made to ensure that the zone setpoint is never reduced below a preset, minimum zone setpoint value or average temperature of the hottest billet inside the zone. The zones automatically ramp up whenever the drop in the zone temperatures divided by the ramp rate is greater than the time left for the delay to end. This ensures that the furnace is ready when the delay is over. Unscheduled delays are unexpected delays. Since the delays are unexpected, the end time is usually not known in advance. When such delays are encountered, the zone setpoints are reduced to force the burner to reduce the firing rate. As the furnace temperature goes down, the setpoints are further reduced until either minimum zone setpoint is reached or hottest billet tempearture in the zone is reached. Mathematical Model The mathematical model consists of a finite difference heat transfer algorithm, which calculates temperatures throughout the thickness of billets at different positions along the length of the furnace. These temperatures are obtained by solving the system of heat transfer equations. The mathematical model executes at a predetermined time interval or steps. At each calculation step, the model determines the amount of heat that has diffused inside the billets since the previous calculation step. The Heat Transfer calculations take into account Steel Grades, Product Dimensions, Charge Tempeartures, Charge Postions inside the Furnace, Furnace Profile, and Product Tempeartures at the last step. Communication Tracking information should come from the tracking computer to our HeatXpert system. HeatXpert system calculate the setpoints and send them to the supervisory system or PLC. The process variables come from the supervisory system or PLC to our HeatXpert system. HeatXpert System can reside on the same computer as the supervisory system or could be a different computer. In the same computer data passing will be relatively simpler. We do Reheat furnace study and Audits with an objective to Improve Furnace Controllability, Increase Production Rate, Improve Product Quality and Increase Fuel Consumption. The specific areas we concentrate are refractory conditions, Burner firing and controls, Optimum Heating Parameters and Furnace Design. Our study includes on site furnace inspection during opeartion and complete report on our finding with receommendations. We also specialize in operational data annalysis to look into the historical process data, identify patterns and relationships among discrete process steps and inputs, and then optimize the factors that prove to have the greatest effect on yield.